Chalk this one up to 'how on earth have they not done this before', but seriously: How has this not been done before? Look at that giant, spinning Mjolnir! That's great. 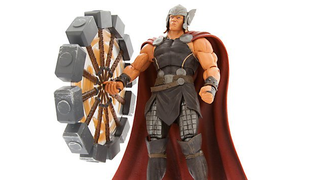 There have been Thor toys that throw the legendary Mjolnir around before, yet somehow there's never been a version of it with a Thor toy that replicates the hero spinning the strap around, as he's wont to do basically all the time. I mean, it's basically what Thor does with Mjolnir all the time, outside of thwacking it in people's faces, so how has it take this long to be translated into a toy form? Well, step up, Diamond Select: It's your time to shine. The company's latest figure in the Marvel Selects line, based on the Odinson's comicbook appearance, stands at 7 inches tall and comes with not just an alternate helmetless head, but a normal version of Mjolnir to pose him just like you would any usual figure of the God of Thunder as shown above. But honestly, why would you when you could use that awesome spinning piece instead? It's a really clever way of depicting Thor's spinning motion, 12 hammers loosely connected by plastic 'swooshy' effects in a giant circle. And it looks great! An otherwise relatively humdrum figure, transformed into something unique by a simple accessory. If you want one of your own, the figure's currently available on Marvel's store for $25.